This months manufacturing PMI data only confirm what several months of prior surveys (and now the latest US jobs report) have been telling us, namely that growth in the developed economies is getting scarcer and scarcer, and harder and harder to come by. 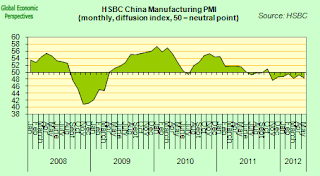 Following a brief brief period of stabilisation, which lasted roughly from November last year to this January, conditions have been steadily deteriorating in manufacturing sectors across the planet, with the deterioration being lead by an ongoing decline in new export orders. 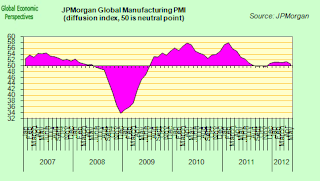 Roped in together through the various trade channels, the worlds industrial base is now, even in the best of cases, barely ekeing out growth, as can be seen in the fact that the JP Morgan global index registered a mere 50.6 in May, only marginally above the 50 no change level. 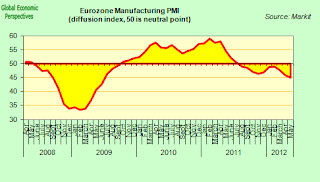 As the Global report puts it, the main drag on global industry remains Europe, where the Eurozone and UK PMIs fell to three-year lows. PMIs for Germany, France, Italy, Spain, the Netherlands and Greece all signalled contractions. Ireland saw a modest expansion, while Austria edged closer to stagnation. 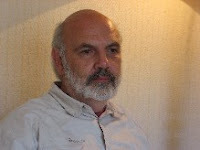 But beyond this activity in Eastern Europe weakened, as it did in Asia and the Americas. 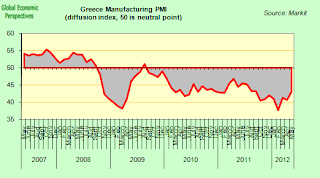 With the world nervously waiting to see how the Greek election process pans out, and where the Spanish government will find the money to recapitalise the country's banks, the slowdown in China is turning out to be a wild card, which simply punds negative feedback into an already difficult situation. Ireland was the only nation to register accelerating, albeit modestl, expansion, while in Austria - the other country in the Area where manufacturing conditions still improve - the PMI slipped back and closer to stagnation. 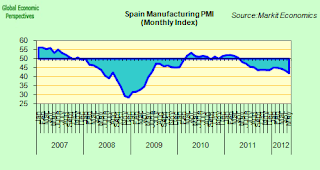 All the other Euro nations covered by the survey saw contractions.PMIs for Germany, France and Spain all fell to their lowest levels since mid-2009, while the downturn in the Netherlands accelerated to its fastest in five months. In a pretty symbolic gesture, Greece moved off the bottom of the euro PMI league table for the first time since January 2010 to be replaced by Spain. 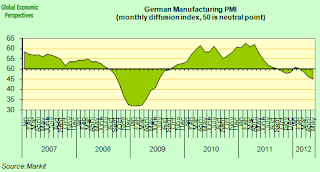 “Germany’s manufacturing output continued to lurch downwards in May, with the resilience of the first quarter now giving way to the steepest drop in production levels for almost three years. Weaker global economic conditions resulted in shrinking order inflows, especially from export markets. 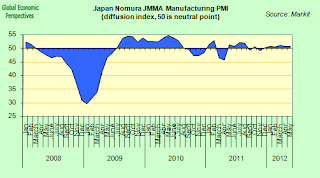 The latest drop in new work from abroad was the fastest for six months, which manufacturers linked to softer demand within Europe and signs of a slowdown in Asia". “It is hard to beat the bad news conveyed by much deeper than expected GDP contraction in the first quarter of this year and in this sense the weakening PMI comes as no surprise. 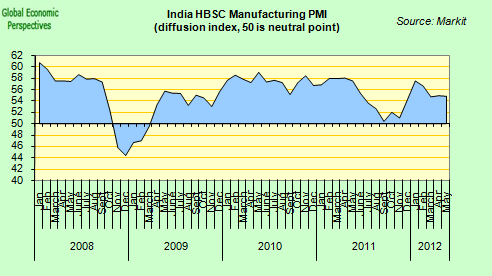 But the PMI index still points to downside risks in the coming quarters. 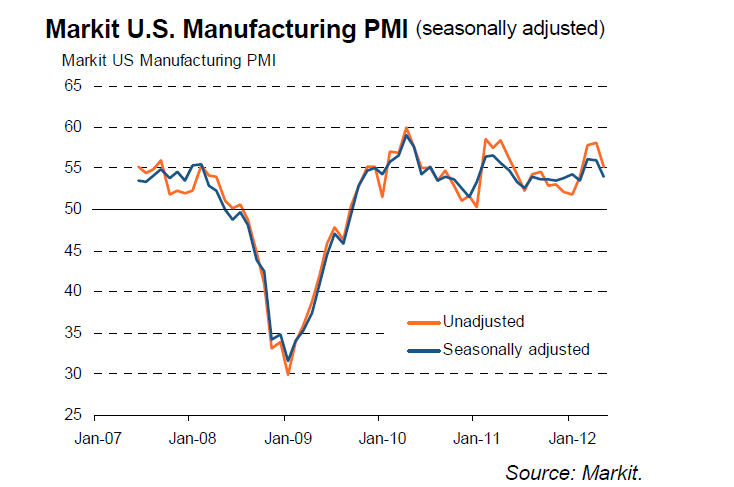 The outlook for growth keeps getting worse. Higher than expected German GDP growth in 1Q12 failed to support the Czech economy while, most recently, the leading indicators, ZEW and Ifo, have deteriorated and caught-up with the weakening PMI trend. 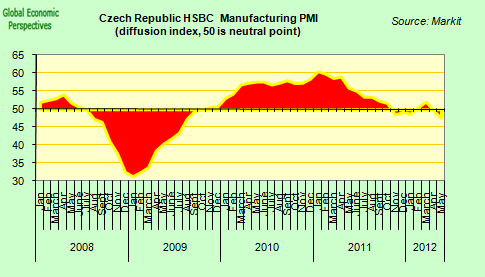 Indeed the Czech May PMI collapsed to a 33-month low driven by the new orders and the new export orders. Exports growth was stable in the first quarter of 2012 but would have likely slowed in the second quarter adding to downside pressure on growth. 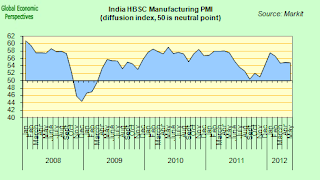 The outlook for the manufacturing sector has deteriorated sharply in the last couple of months following Nov-11 to Mar-12 recovery". 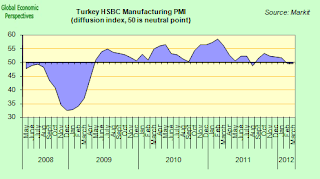 Manufacturing activity in Turkey also fell back to near the 50 no change level, which is again worrying, becuase one of the growth areas we should be looking for is in emerging markets. “Manufacturing sector growth almost stalled in May, after a notable improvement in April due to a very subdued rise in output volumes and a minor contraction in new orders. New export orders, on the other hand, showed a slight improvement, suggesting that the slowdown in economic activity is driven more by moderating domestic demand, while Turkish exporters continue to successfully diversify geographies for trade". 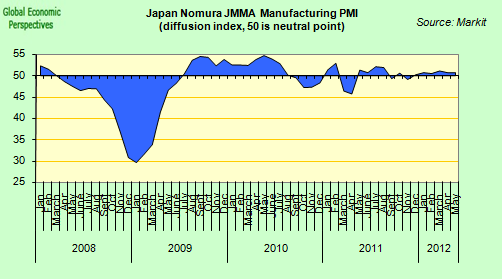 Japanese industry continues to move sideways, with an ongoing decline in export activity being offset by domestic demand which is fuelled by the continuous stimulus and reconstruction spending by the government. The order book is a good indicator in this sense. "The latest rise in new orders was the fifth in as many months. Companies mainly attributed new order growth to better demand from domestic sources. Although only slight, the overall increase in new orders contrasted with a further decline in new work received from overseas clients. Goods producers commented on muted demand from China and Europe". “Activity in the Indian manufacturing sector kept up the pace in May with output, quantity of purchases and employment expanding at a faster pace. New orders decelerated slightly led by domestic orders and stock levels rose, suggesting a slight moderation in output growth going ahead". 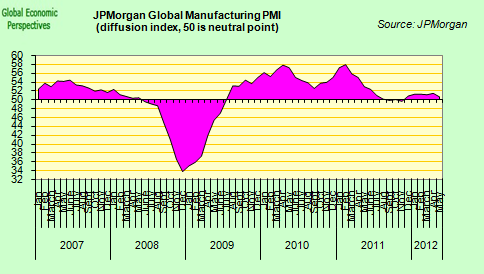 At 54.0, down from 56.0 in April, the final Markit U.S. Manufacturing Purchasing Managers’ Index came in a tad higher than the earlier flash estimate of 53.9 but nevertheless still signalled the weakest improvement in business conditions since February.New orders, in contrast, showed a slightly smaller rise than indicated by the flash estimate, taking growth sharply lower than seen in both April and March. The weaker growth of total new orders reflected to a large extent a near-stagnation of new export orders for the second successive month, which contrasted with more robust growth rates seen earlier in the year. The marginal rise in new export orders was also even smaller than the flash estimate. 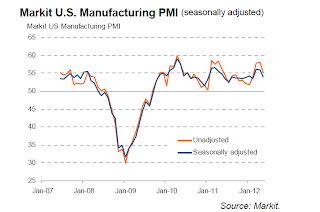 “The final PMI data confirm the earlier flash reading showing growth in the U.S. manufacturing sector to have slowed in May. The sector nevertheless continued to expand at a reasonable pace, growing at an annualised rate of around 3%, and should contribute to sustaining steady though unspectacular economic growth in the second quarter". 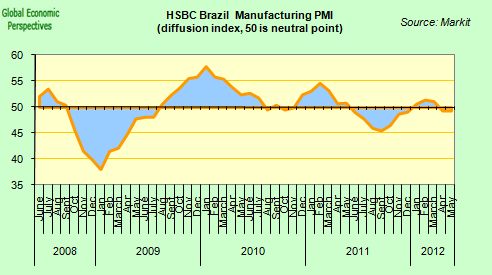 Further South, May data signalled a second monthly decline in both output and new orders at Brazilian manufacturers. 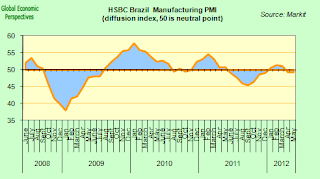 Nevertheless, at 49.3, unchanged from April, the PMI was only slightly below the neutral threshold suggesting only a modest deterioration in Brazilian manufacturing business conditions.Firms working in Brazil’s manufacturing sector generally linked the deterioration in operating conditions to weak client demand. The volume of new orders received by companies fell for the second consecutive month in May, albeit the decline was only modest and to a lesser extent than in April. Meanwhile, new export orders also fell during May, with the rate of decline solid and the strongest in 2012 to date. 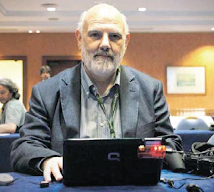 There is one simple, easy and unequivocal message to be garnered from all this - the Euro crisis needs to be settled and resolved in the shortest time possible. This won't be easy, but it has to be done. 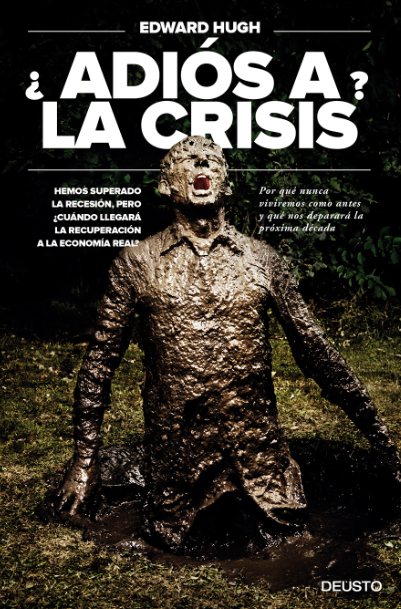 What was once a small localised crisis with its epicentre in Greece, having spread to the entire Euro Area is now extending beyond the frontier of the monetary union, and threating the entire recovery on a global basis, as investors loose their appetite for risk fearing the arrival of another Lehman moment. Naturally, the problem isn't only the Euro, most developed economies are overleveraged and struggling under the weight of legacy debt. Meanwhile China offers another warning. Simply pumping up demand in unsustainable quantities in areas like construction may bring short term export advantage for the West, but in the longer term the problems produced make the process hardly worth the effort, a point which could well be borne in mind when thinking about policy towards the Indias, Turkeys and Brazils of this world, where short term capital flows have pumped up consumer credit in undesireable ways. Since these countries have started increasing credit from a very low base, the threat is hardly dire at this point, but warnings should be heeded. With domestic mortgages at something like 5% of GDP Brazil is somewhere near where Spain was in 1992. 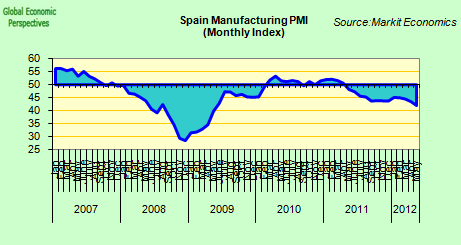 No big deal, but imagine the process is allowed to continue unchecked, and then look where Spain is now, or rather was when the bubble burst in 2007, a mere 15 years later.